Combine expert programming and graphic design with original, engaging copy to create a successful website. Adventure Web has strategic relationships with professional copywriters who know how to craft content that readers respond to and that contributes directly to your higher search engine ranking. It takes experience and talent to convey your company’s message and mission while maintaining the right amount of keyword density; that’s why we recommend writers who know what kind of writing works best on the web. Our copywriting partners conduct extensive intake sessions in order to fully understand and be able to write about your company, its goals, and its relationship with its customers. After the intake session, copywriters work with our designers and account managers to ensure that the top keywords are woven into the text. Turnaround is quick so that you can provide feedback to the copywriter who will incorporate your suggestions and edits before submitting the final draft. Once the copy is written exactly the way you envisioned it, all that’s required is your approval, and the content is delivered to Adventure Web for layout. Getting your message across is a crucial step in the development of your website. Partner with a professional who knows the power of the written word. Learn how our blogging program works & why it is so successful building our client’s businesses. 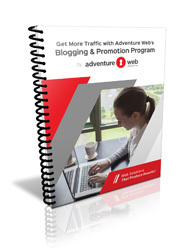 Contact Adventure Web today to get in touch with an experienced web copywriter. Call 410.788.7007 or 866.488.8644.